We operate nine indoor mobile domes from Bournemouth, Poole, London, St Albans, Bristol, Brighton, Glastonbury and in the north; Warrington, Beverley in Yorks, covering the whole of the UK and EIRE. In addition we have two special outside domes for large events and fairs available from the and a new style all weather dome from 2014. 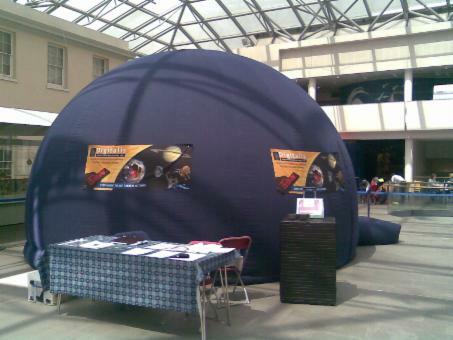 These dome can now be booked and are the first large scale outside portable domes in the UK. The indoor domes are different sizes and designs to fit all school and village halls. Not all domes are available at all our locations across the UK but there is always a good choice of sizes available. The domes are measured in diameters and the 7 metre dome is only available to travel from our base in Bournemouth or now a new 7m dome from London. Important --We do not charge extra for bigger domes. Please be aware of the height at top of the dome (Zenith). 45 adults or 50/55 young children. Possible 60 max for age 5 year old. 40/45 max above age 8. 60 adults or 60+ young children. 1. 'Ganymede Dome', A UK-made 6 metre diameter indoor dome. 2. 'Europa Dome'. A US-made 6 metre diameter indoor dome. 3. TWO 'Lunar Domes' smaller US-made 5 metre diameter domes. 4. 'Jupiter Dome' . A very large US-made 7 metre diameter dome. 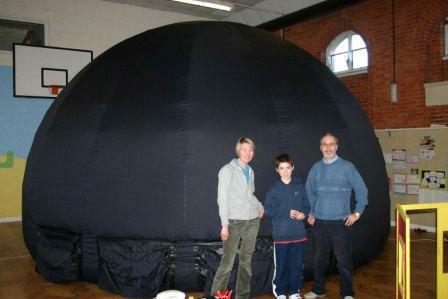 The Ganymede Dome can cater for a large event up to 45 seated adults people with special multimedia equipment and lens to provide a spectacular show for entertainment and education that only a planetarium can provide. 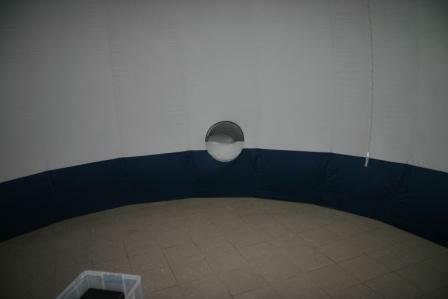 The dome itself is made of fireproof material and supports easy access for wheelchair users if required. Within the dome there is an elaborate ventilation system to ensure comfort for the audience. Upon arrival at your venue the dome can be made ready for an audience within as little as 40 minutes. We can typically accommodate 50+ children up to age 7 yrs, or 40-45 aged 8 yrs and above, per presentation (if seated on floor). The Ganymede Dome can work in a restrictive area, please contact us if you have a height or width problem with the dimensions below. The dome requires a room 7.5m long x 6.75m wide x 3.4m high. Ready access to a standard 13amp power socket is also required. The Europa Dome is specially designed for all surround dome projection. We use this with our new US projector to provide full planetarium shows and 3D effects on space pictures and films. This dome can hold up to 50 younger children to Y3; but only 40 older children. Please be aware that the height restrictions and bigger space for use with this dome detailed below, but it is an impressive dome made of unique space themed material. The Europa Dome will require a room of sufficient size, typically, at least 7.5m long x 6.75m wide x 3.7m high. Ready access to a standard 13amp power socket is also required. 3. 'Lunar Domes' TWO smaller US-made 5 metre diameter domes. The TWO Lunar Domes will fit into small halls and rooms with high ceilings, as they can sit against the top of a ceiling, if required. The domes are US-made 5m dome and will accommodate up to 40 Primary School-age children or up to 25 adults. 4. 'Jupiter Dome'. A US-made 7 metre diameter indoor dome. The Jupiter Dome is specially designed for all surround dome projection. We use this with our new USA ZETA projector (2012) to provide full planetarium shows and 3D effects on space pictures and films. The dome can hold up to 60 younger children to Y3; and 50 older children. Please be aware that the height restrictions and bigger space for use with this dome detailed below, but it is an impressive dome made of unique space themed material. The Jupiter Dome will require a large hall (normally a sports hall) of sufficient size, typically, at least 7.5m long x 7.5m wide x 4.2m high. Ready access to a standard 13amp power socket is also required.